Assurex Global is the world’s largest privately-held risk management and commercial insurance brokerage group. Employing more than 19,000 insurance professionals on six continents, the 100-plus independent insurance brokers who constitute Assurex Global generate annual premiums of $28 billion. Founded in 1954, Columbus, Ohio-based Assurex Global is a unique international corporation that marshals the experience, expertise, products and services of the world’s most successful and respected independent risk management, commercial insurance, and employee benefits professionals. Partners are selected on the basis of their premier market position, history of growth, quality, breadth of services, integrity, and commitment to serve the clients of all Assurex Global Partners around the world. A hallmark of Assurex Global is the fact that all Partners, regardless of city and country, are committed to providing an immediate and professional response to other Partners' requests for advice on local insurance conditions, assistance with local coverages, and other local services, including claims and loss control. Worldwide, the sun never sets on Assurex Global. With Assurex Global, you enjoy access to the most experienced local brokers, delivering the best insurance products and services in every country of the world. Wherever clients have assets at risk, hands-on advice and services are available from local Assurex Global brokers familiar with the regulatory environment and customs of each country. Why Work with an Assurex Global Partner? Assurex Global is the world’s largest privately held commercial insurance, risk management, and employee benefits brokerage group. At Assurex Global, we’re committed to serving our clients, not the whims of Wall Street. Our independence – on the corporate and Partner levels – sets us apart from our publicly traded national competitors. Assurex Global marshals the expertise of independent, locally owned and managed insurance brokers on six continents to generate annual premiums of $28 billion. From California to the Congo to cyberspace, more than 19,000 Assurex Global professionals deliver seamless global insurance and risk management services wherever clients have assets at risk. We’re Assurex Global; Owned by the largest independent insurance brokers; supported by local professionals in every corner of the globe; trusted by business owners and risk managers worldwide. A typical Assurex Global Partner is owned and managed by insurance professionals who live, work and were raised in the local community. At Assurex Global, we actively encourage the perpetuation of ownership, ensuring Partner ownership passes from one generation of employees and managers to the next. Our Partners encourage employee-entrepreneurs to lay down roots in the community. When it comes to long-term stable client relationships, the competition just can’t touch Assurex Global Partners. Assurex Global Partners embody the entrepreneurial spirit. Through employee incentive programs, perpetuation plans and good old-fashioned motivation, our Partners grow from within, rather than through acquisition. The acquisition of brokers may speed growth, but it does so at the expense of the entrepreneurial spirit. Unlike competitors who grow through acquisition, Assurex Global is committed to gathering the talent and experience of independent firms - without diluting their individual strengths. Assurex Global Partners are not just names in a database. They are colleagues and friends who formally gather at Assurex Global conferences and meetings. On a less formal basis, Partners are free to tap into one another’s experience and expertise - and take liberal advantage of the opportunity to do so. If one Partner firm lets down another one, it is likely that the next time the owners meet, the subject will be raised. For Assurex Global Partners, common ownership definitely means closer ties. Assurex Global handpicks only the best independent brokers per market to become a Partner. From a rigorous due diligence process during the selection phase to demanding performance reviews every three years, we make every effort to ensure only the best brokers become and remain Assurex Global Partners. The flexibility to choose the best and remove the weak is a luxury reserved for independent companies like Assurex Global. A key benefit of Assurex Global is the ability to tap the experience and expertise of other local Partners on six continents. To ensure swift and smooth communication between Partners and maximize client service, Assurex Global requires each Partner to assign a gatekeeper to oversee the business of other Partners’ clients. Typically a senior manager or owner, the gatekeeper treats a Partner’s client like part of the family - without regard to the client’s size or impact on the broker’s bottom line. The result, Assurex Global clients are served by the “A” team, regardless of where their business takes them. Assurex Global is the world’s largest privately held commercial insurance, risk management and employee benefits brokerage group. Only the three largest publicly owned brokers generate a larger premium volume than Assurex Global. Only the best independent agency in each market area is invited to become an Assurex Global Partner. Each is carefully selected on the basis of its premier market position, history of growth, quality, breadth of services, integrity, and commitment to serve the clients of all Assurex Global Partners. Assurex Global Partners meet rigorous financial and leadership standards to be admitted into the organization. They are re-evaluated every three years. Expertise in problems unique to geographic area. Broad access to insurance markets. Financial strength that reflects sound business practices. Reputation for progressive business leadership and highly respected by the insurance industry and by the local/regional business community. Commitment to conducting business for the long haul. Active participation with other Assurex Global firms to solve client problems. Every Assurex Global Partner periodically undergoes an in-depth evaluation to ensure they continue to meet stringent qualifications. Factors considered are growth, creativity and their ability to provide the highest level of professional services. Assurex Global Partners are focused on their clients. As privately owned, locally focused, and globally aware businesses, Assurex Global Partner firms owe their success to their focus on client needs. Nothing – not corporate goals, management demands, or shareholder interests – stands higher in priority than the risk management, insurance, and employee benefits needs of clients. Assurex Global Partner firms are structured to serve clients first. Their private ownership assures that they have no agenda that competes with client needs. Partner firms have no corporate headquarters in a distant city or country that they must answer to. With more than 600 local offices around the globe, Assurex Global Partners have professionals right where our clients work and live. Yet Assurex Global also brings clients the benefits of size, strength, and global visibility. Our Partners form the world’s largest privately held risk management, commercial insurance, and employee benefits firm. With more than 100 independent brokers and 19,000+ professionals on six continents, Assurex Global knows international risk management. Our network has size and savvy to build and develop relationships with insurance carriers, alternative markets and other vital resources. Our clients benefit directly from these relationships with access to significant levels of insurance capacity and insights into the best risk-management tools and strategies. Assurex Global stands behind every Partner firm as an organization dedicated to providing comprehensive, effective resources needed to meet client needs. These resources enable locally managed Partner firms with the ability to “think globally and act locally” in managing and placing client risks with insurance carriers around the globe. Founded in 1954, Assurex Global is an exclusive Partnership of the most prominent independent agents and brokers in the world. 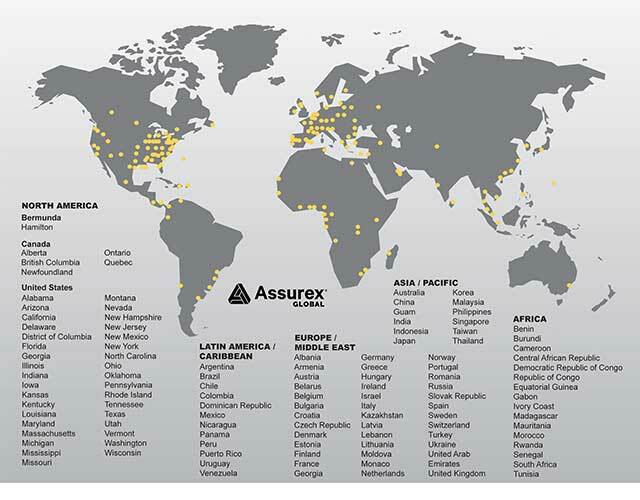 With $28 billion in annual premium volume and more than 600 Partner offices, Assurex Global is the world’s largest privately held commercial insurance, risk management, and employee benefits brokerage group. Assurex Global’s combination of local expertise and global reach helps you navigate the changing insurance landscape with confidence.